At Allied Chiropractic your road to relief begins with the initial visit, which includes a consultation (bilingual English and Spanish available), case history, physical examination and x-rays if needed. A spinal exam and analysis will be performed to determine any structural abnormalities. The spinal analysis is the key to deternining the appropriate treatment. Once Dr. Wilkinson has determined the extent of your spinal stress or abnormalities, a spinal adjustment is performed. These vertebral adjustments or "manipulations" can result in immediate change in your pain or discomfort. The adjustments are made by hand without the use of drugs or instruments. 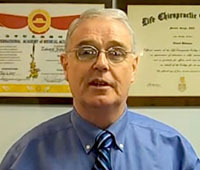 Dr. Wilkinson uses specialized techniques to apply gentle pressure to the areas of the spine that are out of alignment or do not have sufficient range of motion.Most appointments last thirty minutes and the number of treatments can vary from patient to patient depending on the severity and source of the pain. In addition to chiropractic services, Dr. Wilkinson also has a Virginia Certified massage therapist on staff. Board-certified Chiropractic Physician, Dr. Edward Wilkinson has maintained a successful practice in Alexandria since 1991. Since he opened his office he has cared for more than 4,000 patients. Originally from Chevy Chase, Maryland, Dr. Wilkinson received his undergraduate degree from the University of Miami and his doctorate degree from Life Chiropractic College. He is your best choice in an Alexandria, Virginia chiropractor. Appointments are available from 8:00 a.m. to 8:00 p.m., Monday through Friday and 9:00 a.m. to 1:00 p.m. on Saturday. All major insurance plans are accepted. For more information, please call (703) 823-1414.